Honor has announced it will be hosting an event on January 22nd in Paris, teasing it will launch a smartphone with hole drilled in the display for the selfie camera. With this, Honor has joined the ranks of Samsung, Lenovo, and its parent company Huawei in launching a phone with selfie camera hole to maximise the display panel without incorporating a notch. 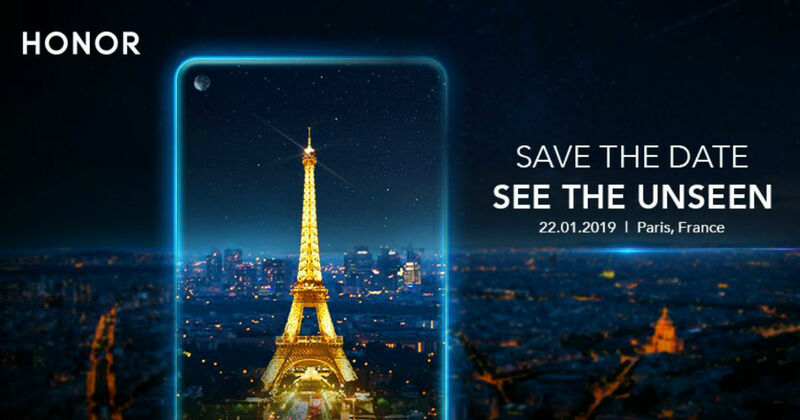 However, while the brands are launching their respective models in China only for now, the Honor event in Paris hints at a global release for the smartphone. The official Honor invite shows an outline of a smartphone with rounded corners around the Eiffel Tower, with the moon appearing on the top right corner. The placement of the moon in the image alludes to the position of the cutout for the selfie camera on the smartphone. Other than that, the invite mentions that the event will be held on January 22nd and that the venue will be Paris. There is no word yet on which smartphone will be unveiled at the event, but we can expect it to be Honor View 20. The smartphone will be a flagship-class device with a mid-range price tag and likely be powered by the company’s new HiSilicon Kirin 980 SoC with a dedicated Neural Processing Unit (NPU) for AI-related tasks. Lenovo is all set to launch its Z5s with a selfie camera cutout and triple rear cameras at an event in China tomorrow, December 6th. This will be followed by the launch of Galaxy A8s on December 10th and Huawei Nova 4 on December 17th. While the Samsung, Huawei, and Honor handsets will have the selfie camera hole located on the top-left corner, the Lenovo model will have it in the middle. Ravi leads the news team at 91mobiles and has been working in the field for almost 7 years, with stints at NDTV Gadgets and TOI Tech. When not busy with the daily grind of news, he can be found engrossed in manga or listening to The Beatles.